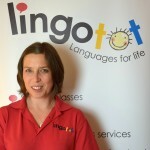 Batley & Dewsbury Lingotot Centre | French and Spanish classes for kids. MFL PPA cover. Hello! I'm Amy and I'm a qualified secondary school teacher with years of experience of teaching Spanish, French and German. I decided I wanted to widen my horizons and now absolutely love running Lingotot classes in the Mirfield, Dewsbury, Cleckheaton and South Wakefield area of West Yorkshire. Languages have always been a big part of my life ever since I uttered my first foreign word at school and was exposed to the mysterious world of being able to converse with someone not speaking English. It has always intrigued me and still does and I love sharing this enthusiasm and passion. Young children are wonderful to work with and seeing them learn new vocabulary so quickly and with such ease is so rewarding. Lingotot classes are fun and interactive and introduce young children to a language through songs, play, stories and crafts. You can come along and get involved at one of our preschool classes or perhaps you would like us to run a session in your child's nursery? Maybe you would like us to pop in to your local school and get a breakfast/lunch or afterschool club set up? Maybe your little one attends primary school and you would love us to help them learn new language during classtime? We have lots of options available so please get in touch for more information and hopefully we'll see you very soon!